President George W. Bush hung out with his best political partner in the world, hosting departing British Prime Minister Tony Blair for a rare White House sleepover and a farewell chat out on the Truman Balcony. It was hard to imagine such a scene at the start of Bush's presidency, hard to foresee that two men of such vastly different politics, background and bearing would become the other's indispensable supporter. It may be harder still to imagine that Bush will find the same got-your-back kinship with Britain's next prime minister. "Will I miss working with Tony Blair? You bet I will. Absolutely," Bush said at an elegiac news conference Thursday, the two leaders' Washington swan song before Blair leaves office next month. "Can I work with the next guy? Of course. " The next guy is Gordon Brown, Britain's Treasury secretary and Blair's longtime political rival. Although assuming leadership of the same Labour Party that has sustained Blair for a decade as prime minister, Brown is eager to put political distance between himself and Blair. One easy way to do that would be to also put distance between Britain and the United States, especially on the politically toxic issue of the British military commitment in Iraq. Britain under Blair has been Bush's steadiest ally in Iraq, sending more troops and keeping them there in larger numbers than any other nation. That earned Blair the nickname "Bush's poodle" at home, where enthusiasm for the war has gone from lukewarm to stone cold. There is a strong perception in Britain that Blair got little in return for his fealty. "I believe that the relationship between the United States of America and Britain is a relationship that is in the interests of our two countries and in the interests of the peace and stability of the wider world," Blair said. "And sometimes it's a controversial relationship, at least over in my country, but I've never doubted its importance." The war is unpopular in the United States for reasons that have nothing to do with Britain. The notion that the trans-Atlantic alliance would be, in Blair's careful understatement, "controversial," probably would not even occur to most Americans. Bush did acknowledge the political price Blair paid for his loyalty, striking a thoughtful pose when a British reporter asked whether he is to blame for Blair's exit. "I haven't polled the Labour conference, but could be," Bush said to laughter. Bush said he has met Brown, whom he called "a good fellow." 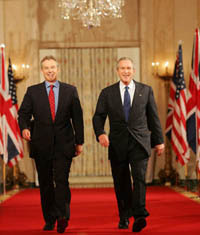 "I hope to help him in office the way Tony Blair helped me," Bush said. Brown signaled a shift in policy in Iraq last week, but offered few details. He said he would make his first trip to Iraq in the coming weeks to make an assessment. "There are too many people in Iraq who don't have a stake in the economic future of the country, too many people unemployed, too many people who are not seeing services developed ... and therefore too many people who don't feel loyalty to the regime," he said. Blair announced in February that his government would reduce its troop level by 1,600 to about 5,500 this spring, but would retain a presence in southern Iraq until at least 2008. A total of 148 British soldiers have died since the 2003 invasion. As Thursday's Rose Garden news conference wound down, Bush looked on admiringly while Blair made a forceful, eloquent case for the long-term goals he said were at stake in Iraq. "We took a decision that we thought was very difficult. I thought then, and I think now, it was the right decision," Blair said, adding as Bush did that history would be their judge. "But one thing I know is that what we represent coming here today, speaking in the Rose Garden to you people and getting your questions and being under your pressure, that is a finer and better way of life than either a brutal, secular dictatorship or religious extremism," Blair said. "It's a better way of life and it's the way of life, actually, people, anytime they are given the choice, choose to have. And what we should be about, our two nations, is giving as many people in the world as possible that choice and being proud of it." That was Blair answering the political epitaphs that say his chance for greatness was extinguished by Iraq, or that his political gifts were wasted on an ungrateful U.S. ally. Bush took the hint, and ended the parley there. "What I know is the world needs courage," he said simply. "And what I know is this good man is a courageous man."